The Mediterranean Sea has unique marine features that make this region particularly vulnerable to climate change. The narrow connections with the Atlantic Ocean through the Strait of Gibraltar, with the Red Sea through the Suez Canal and with the Black Sea through the Bosphorus Strait restrict the overall extent of water exchange. In addition, Mediterranean seawater can more easily heat up and evaporate, due to reduced size of the basin combined with hot, dry summers and low inflow from rivers. The Mediterranean also lies in a transition zone between the arid climate of North Africa and the temperate and rainy climate of central Europe, so it is affected both by tropical climate processes (e.g. droughts) and extreme mid-latitude events (e.g. strong winds). There is a large body of evidence that climate change is already playing a role in modifying both terrestrial and marine features in the Mediterranean, altering ecosystems and inducing habitat changes, as well as creating favourable conditions for the proliferation of non-indigenous and invasive species. All these factors are working to shape a Mediterranean different from the one we know. 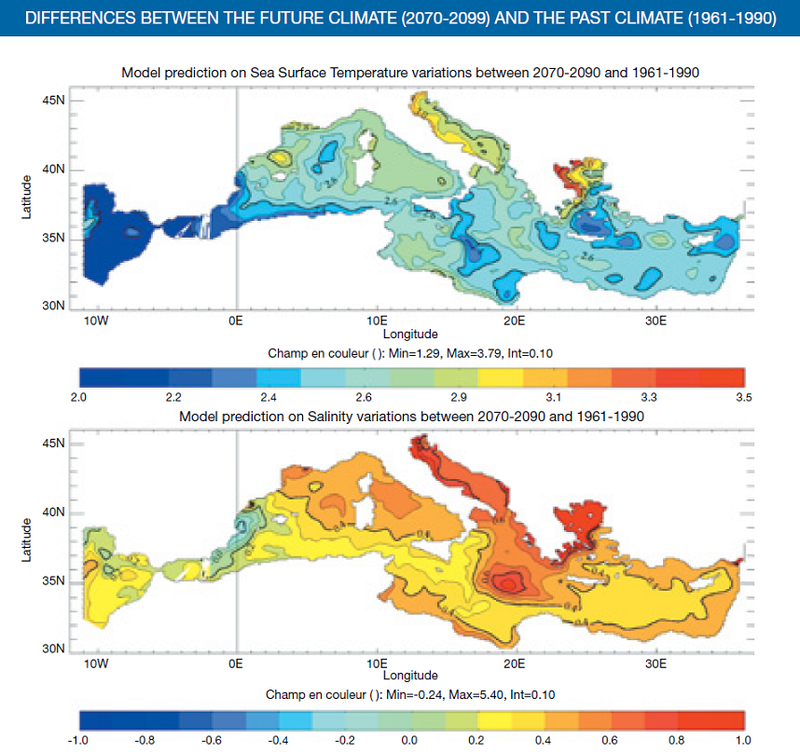 Local and regional scale evidence is accumulating to show that the Mediterranean Sea is warming and changing the stratification of the seawater column. Understanding, monitoring and managing such climate-induced change is critical for Marine Protected Areas (MPAs). MPAs are efficient management tools for ameliorating human impact on coastal marine ecosystems. By increasing ecosystem stability, they promote resilience and faster recovery from disturbance.